For nearly a decade Hoochinoo has been showcasing, supporting and promoting new acts from the UK’s underground alternative hip hop and urban music scene. On Friday 23rd November the brave’s invite you to join them for the M9 ‘Magna Carta’ album launch party. The night will feature the most explosive UK hip hop artists, visuals and live performance at the Vibe Bar in London’s Brick Lane. The night has live performances from M9 aka MELANIN 9, GENESIS ELIJAH and REWD ADAMS, as well as special guest appearances from CYRUS MALACHI, SKRIBLAH DANGOGH, LOGIC, IRON BRAYDZ, PHOENIX DA ICEFIRE AND DJ279 (CHOICE FM). It’s going to be a fantastic night of music, celebrating everything that is UK hip hop, so get involved and let M9 and friends show you how it’s done.. Mean Fiddler & This Is Hip Hop Live Present..
What happens when you have two underground kings, a rapper from the upper echelons of rap elite and a name synonymous with the foundations of hip hop in one building, all for one show… RAP MAYHEM! Rap Mayhem is a unique opportunity to catch the founding members of Jedi Mind Tricks, La Coka Nostra, Organized Konfusion and D.I.T.C performing live in London for an exclusive, first of its kind, festival tour at The HMV Forum in London on 30th November, 2012. A programme that will feature live sets from Vinnie Paz (Jedi Mind Tricks) & Ill Bill (La Coka Nostra), Pharoahe Monch, O.C & A.G (D.I.T.C), DJ Boogie Blind (The X-ecutioners) and more… Where some of the most critically acclaimed work in Hip Hop will be delivered, live and direct, from foremost practitioners of the art form. Expect heavy beats, rugged rhymes, intricate lyricism and incendiary live performances. 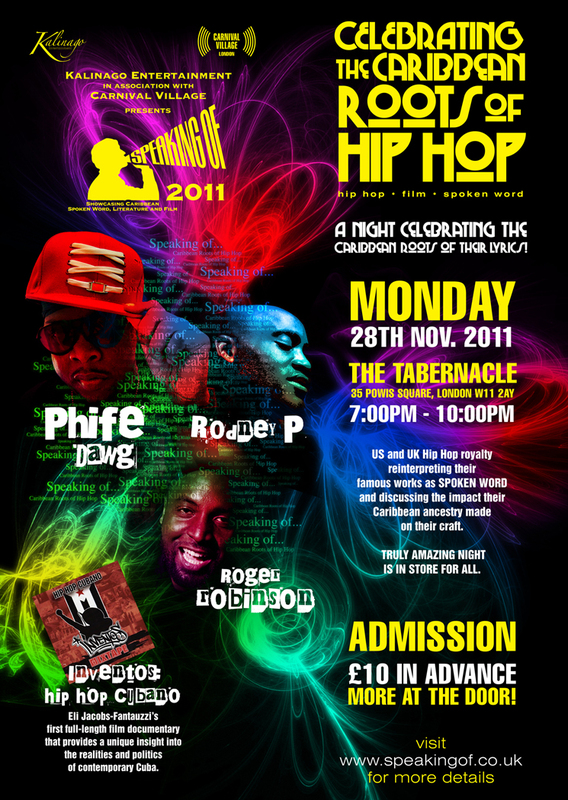 A Hip Hop event of epic proportions, not to be missed! [London] A TRIBE CALLED QUEST SPECIAL: Beats Rhymes & Life – Premier with Phife Dawg LIVE @ Koko Mon 21st (SOLD OUT) & 22nd November @ Cargo! Soundcrash & The Doctor’s Orders are proud to present the UK premiere of ‘Beats, Rhymes & Life: The Travels of A Tribe Called Quest’, Michael Rapaport’s award winning film documenting the highs and lows of Hip Hop’s Golden Era’s most celebrated group A Tribe Called Quest. Featuring an original soundtrack by Madlib and including humorous & insightful interviews with the likes of ?uestlove, De La Soul, Ghostface Killah, Pharrell Williamsm Adam Horowitz and Mary J Blige as well as extensive accounts from Q-Tip, Phife Dawg, Jarobi White and Ali Shaheed Muhammad, never has the story of A Tribe Called Quest been better told. The screening will be followed by an exclusive live show by original Tribesman Phife Dawg featuring ATCQ classics from ‘Peoples Instinctive Travels’, ‘Midnight Marauders’, ‘Low End Theory’, ‘Beats, Rhymes & Life’ as well as new material. An essential night for A Tribe Called Quest enthusiasts and music lovers in general. As Beats, Rhymes & Life begins, the rappers who anchored pioneering group A Tribe Called Quest are already going their separate ways. As youths in the mid-’80s, the Queens-born foursome of Tribe—Q-Tip, Phife Dawg, Ali Shaheed Muhammad and Jarobi White—found success with their exhuberant exploration and combination of hip hop, pop and jazz. But in recent years, Q-Tip, the band’s visionary and reluctant pop star, has tired of the street-bred capriciousness of his lyrical partner Phife, who is equally frustrated with Q-Tip. How these two friends and musical partners got to this state forms the guts of actor-turned-filmmaker Michael Rapaport’s candid and combustible documentary. It is FINALLY here; the fifth and final event in the legendary Blood In The Water series is upon us! This is NOT a publicity stunt, this is the last ever BITW event there will ever be and it is not to be missed! • First 50 people through the door on DAY ONE get a FREE Don’t Flop bottle opener lighter! • A free raffle – 30 lucky winners receive a pass to a PRIVATE SCREENING of the weekend’s battles on Monday 21st November! This event WILL sell out! Capacity is 300, Arrive early to avoid disapointment! • There will be a LIFT SERVICE operating from 12PM-2PM each day, offering a pick up from STOCKWELL STATION and drop off at JAMM. PLEASE help us spread the word, and invite your friends to! We look forward to seeing you at this LEGENDARY event!